Last week in Assembly the girls listened to a talk by Andre Croucamp, who is the engine behind MindBurst Workshop – an educational consultancy who work to ensure that students and teachers are future-ready. He is trained as a cognitive archaeologist and has studied the evolution of the brain. After discussing all the jobs where computers would perform a better role than humans, his message to the girls was that they need to embrace and encourage disagreement. This is disagreement that is based in reliable data and argued like a scientist. He was, however, sure to point out the difference between disagreement and hate speech as they are vastly different and must not be confused. Another important point that he made is that if you fear failure, then you are unlikely to risk exploring something that is unfamiliar. Without the freedom to make mistakes and integrate insights from those mistakes, you cannot stay in the critical conversation for long enough to benefit from all its possibilities. In keeping with this theme, I came across an article from Goalcast, written by Matt Valentine (14 March 2019) – entitled: “Why You Should Approach Failure Like a Scientist.” He says that most scientists are in pursuit of the truth, rather than something being wrong or right. He also says that a scientist seeks to prove or disprove an hypothesis, which makes it less personal. Scientists also do not see it as a mark of their own lack ow worth if an experiment fails, rather it is part of the process. The Staff and I wish all the Matric students every success as they start their Pre-Preliminary Examinations. I have no doubt that they will achieve in these exams. This year’s Major Production: The Trojan Women delved into the themes of revenge and justice, resilience in the face of brutality and the difference between being a victim or powerless. The girls’ superb acting portrayed a depth of understanding in their roles. The girls’ interpretation of the story was mature and their passion for women’s rights evident in their rendition of this play that dates back to 415 BC. Our young actors showed immense growth in their skills over the last few weeks and we are proud of what they have accomplished. The Art department created a beautiful backdrop and the Art Club, the ‘Domino’ ancient city of Troy, which took centre stage at the Carnival before the start of the play. Thank you to Mrs Lynette Jonker and Ms Danielle Wepener who guided this process. Congratulations to all our actors, the student directors Mia Oliver and Rachel Mackay and the teachers who mentored them throughout the process, Ms Avril Cummins as the director, Ms Rangoato Phogole as assistant director and Mrs Frances Wilmot as assistant director and production manager. The Senior School Traditional Dance club started the year with much enthusiasm. They treated the school to a flashmob to encourage girls who may not have considered participating, to join the fun. The group is excited to host the first Kingsmead Interschools’ Dance Festival in June. On Saturday, 2 March, our debaters participated in the SACEE Central Regional Debating Competition. This was the Junior teams’ first competition and they won two debates each. The Senior teams respectively won one out of three, and the other two out of three debates in a very competitive regional round. Our debaters have shown great commitment and growth and we look forward to progress to the provincial league. Thank you to our coaches Neo Masoeu and Maxine Khumalo, and our teachers in charge Bronwyn Bocher and Cindy Delport. Congratulations to our Grade 4-7 Choir, Junior Glee, Senior School Choir and Senior Glee who performed brilliantly at the recent Singing Sistas Choir evenings, at St Mary’s School, Waverley. They performed with enthusiasm, energy and confidence, and did Kingsmead proud. Isabella Cockeran and Helen Cockeran have been selected for Gauteng Biathle team to attend the SA Championships in the 800m and 1500m events. Mia Spiers has been selected into the Gauteng Central u15B Tennis team. She will be attending the national Tournament later this term. Ruby Vos will be representing Central Gauteng Aquatics at Nationals next month in the 3km and 5km events. Ruby achieved a Bronze medal in the 5km event. At the recent Inter High A gala our B team finished 6th out of 10 schools, and at the Premier gala our A team finished 7th out of 10 schools. Amy Dickenson swam in her first Midmar Mile last month and finished in the top 20 in her age group, with a time of 25 minutes (despite having the lowest seeding possible). This was her first ever Open Water event. She also competed in the Gauteng Schools Swimming Championships in Pretoria last weekend. She received a silver medal in the 400m freestyle and placed top 10 in her other freestyle and IM events. Our diving team competed at Inter High diving competition and finished an incredible 3rd out of 10 schools. We also entered a B team into the B section of the competition and our seniors finished 2nd overall. Olivia Van Vollenhoven and Sarah Benning competed in the Central Gauteng Aquatics Championships over the long weekend. Olivia came first on the 3m in the A Section and in the Women’s Section and she won the Synchronised Event with her partner in the A Section. This qualifies Olivia to compete at the Senior and Youth Nationals for 3m and Synchro. She was, unfortunately injured for the remainder of the competition. Sarah came second on the platform , third on the 1m and second in Synchro (all A group) and third in the Women’s 1m and second in the Women’s Synchro. This qualifies her to compete in the 1m, Platform and Synchro for Senior and Youth Nationals. Well done to Olivia and Sarah! Mixo Salani (Southern Gauteng u16) and Mia Koutramanos (Central Gauteng u17) have both been selected for the Action netball teams to attend the National IPT. Our 1st team ( Old Mutual Cup and Old Petrians ) and u15 ( Sean Fuchs )teams have just competed in the festivals and achieved good results. As part of the Old Mutual Cup, the Waterpolo girls assist Parkhurst Primary with Learn to Swim trainings for their children. The 1st and u15 teams finished combined 5th in the Premier Waterpolo league. At the recent Krugersdorp hockey and netball festival the 1st hockey team won 3 out of 4 matches, 1st team netball won all 7 matches and u16 netball won 4 out of their 7 matches. Soultana Tzitzivacos won double gold in the Gauteng champs in Kata and Kumite. She is part of the Gauteng team who will be competing at National Champs in May. As a part of the Foodology Module, the Grade 9’s had the privilege of speaking to, learning from and baking with Elli Saayman, a specialist patisserie chef. Over a 2-hour period, we took on the challenge of baking macarons. This was a fun and interactive session where we learnt how to measure ingredients and bake with precision. The skills and accuracy we practised will definitely be beneficial to our end-of-term picnic project. Even though many of our dishes did not come out exactly as we wished, we all had a great time learning from our mistakes and laughing about it along the way. During the Grade 9 Foodology Module, we were visited by Pippa Mullins, a registered dietician. She discussed with us the importance of healthy eating and how certain foods and nutrients affect your body. We learnt about BMI (Body Mass Index), how to calculate yours and how to know if you are a relatively healthy person. We also used her special scale which calculates your body fat to muscle mass ratio. Mrs Mullins also discussed with us how important it is to eat from every food group and that it’s never necessary to completely cut one out, in order to have a balanced diet. We also looked at the sugar content of some commercial drinks and it is horrifying to see how many teaspoons of sugar is in each of these, with Coke having almost 10! It was a very informative talk in which we learnt a lot of helpful information, particularly as we are growing young adults. T-shirts called Virtuali-Tees to bring the human digestive system to life using augmented reality. These T-shirts have a special code that is compatible with an App called Curiscope. When the T-shirt is scanned an image of the human digestive system pops up and a voice-over can take you on a guided tour inside the small intestine. On Monday 18 March, the Grade 12 Life Sciences students went on an outing to the Origins Museum at Wits University. They explored Human Evolution by looking at the evolution of Hominid skulls and how stone stools became more complex as Hominid brain capacities increased. The also learnt about the San people who are our living ancestors. The girls were lucky to have a talk from Dr. Marina Elliott, a paleoanthropologist at Wits University who was part of the Homo naledi discovery at the Rising Star Caves. Her expertise and experience as a paleoanthropologist were enlightening, particularly when she explained how painstakingly long it takes to remove fossils during an excavation. Often paint brushes, porcupine quills and toothpicks are used. On Tuesday the Grade 8s took part in an interactive experience with robotics. At first Mrs Govender gave us insight on the different types of robots and the different aspects of what an advanced robot may need to operate. Then for the fun part… we were given a task to use recyclable materials and a basic robotics kit to build a moving car. I believe this was a fantastic opportunity to improve our team building and group dynamics. I thoroughly enjoyed the experience which gave us a chance to be creative and innovative in using our materials. After we had finished the best looking car was judged by the teachers and then we raced our cars in four groups. It was a busy 2-hours but a lot of fun! On Wednesday 27th of February we set out excitedly for our Delta Park adventure. As we arrived you could feel the enthusiasm in the air – it was going to be a great day! We were split into four groups, which allowed us to get to know different girls and explore different aspects of Delta Park. We got to know our surroundings and discover some of its wildlife with Mrs Van der Merwe. We also did multiple water tests on two different parts of the Braamfontein Spruit with Miss Pillay and Miss Rademacher. And finally, with Mrs van Lith we looked at the business side of things as we discussed economic growth in the area. With all this new information from nature, we would base our big STEAM project on a socio-environmental issue that inspired us at Delta Park. We put our learnt theories to practice and were able to observe Science, Geography and EMS working in the real world. Out in the sunshine, outside of the classroom – I think I can speak on behalf of the whole grade in saying that we thoroughly enjoyed our outing to Delta Park. Our adventure to Rand Water, started 7am on March 17th. We excitedly hurried to get to the bus so we could get to Rand Water and start our journey. The ride to Vereeniging was long but gave us a lot of time to think about what was to come. When we arrived we were informed that the programme for the day was to learn and to see the processes that purify our water that we receive in our homes and drink everyday. “Save Water, Save Water” was all that we were thinking throughout our time there, as we realized how long and how many processes it takes to get clean drinking water. The outing to Rand Water made us appreciate water and was also a fun bonding experience. We turn on the tap and water comes out, clean and ready to drink. Very rarely do we consider its source or the need for purification to be safe for human consumption. The Grade 10 Geography Outing to Rand Water was extremely interesting and informative as it gave us a deeper insight into the complex processes involved in bringing clean water to our taps as well as raising our awareness of the critical impact each individual has in responsibly consuming this precious resource. This term under the module Human Rights and Wrongs, the Grade 9 students investigated various human rights violations around the world and the movement of populations as a result of these extreme violations. The South African Amnesty International team visited the Grade 9 girls in order to give them a better understanding about the refugee situation in South African. The visit provided insight about the number of refugees living in South Africa and how we can work together to create an environment of equality, tolerance and empathy for all individuals living in South Africa. The Green Team’s main project for this term has been implementing the recycling process. The team have been spray-painting, labelling and allocating our new recycling bins to their respective classrooms and teaching areas. The commitment shown by girls from the Green Team and also other girls who participated in the three service events is commendable. The Green Team introduced the making of Eco Bricks. We encourage everyone to use their non-recyclable waste at home to make the Eco Bricks and to bring them to school. The Green Team also created awareness for World Water Week and Earth Hour. These internationally recognised events raise awareness of the importance of access to safe and portable water. Kingsmead College turned off all electricity for one hour at school on 29 March from 9:00 – 10:00. A reminder to all parents to please download and refer to the App as the primary source of information, communication and calendar updates. Please email Alex Bouche abouche@kingsmead.co.za if you would like a step-by-step guide to downloading the App onto your devices. 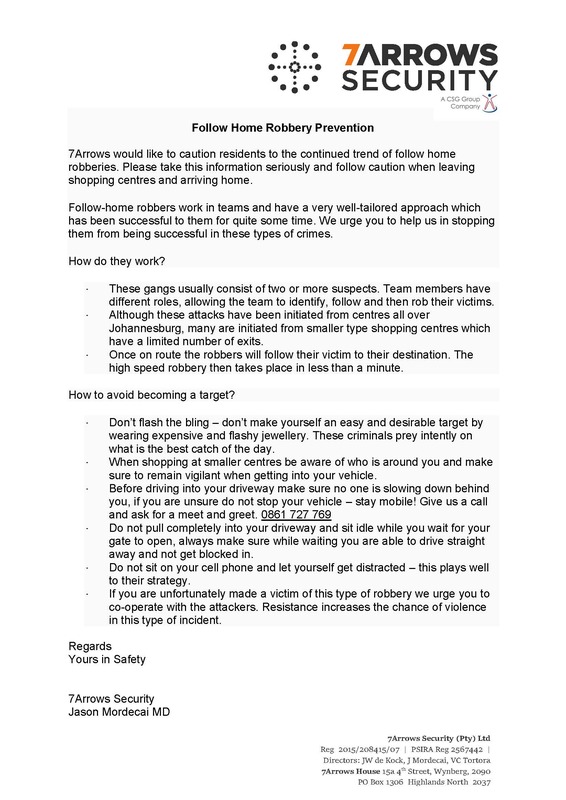 7Arrows Security, the security provider to Kingsmead College, has been proactive in sending out tips to residents of the areas in which they operate in an effort to prevent follow home robberies. As Kingsmead College operates within a wider community we thought it pertinent to share these tips with our community. We have not had any such incidences involving the entering or leaving of our school, this is an opportunity to share the information passed onto us by our security provider as a means to increase vigilance and security. The PTA is an integral part of Kingsmead College – made up of Class Reps for each class from Bluebells to Grade 12 as well as an Executive Committee – it serves as the interface between the parent body and the school. Through its events calendar, service initiatives and various fundraising activities, the PTA strives to build a sense of community within the school – with the interests of the Kingsmead girl top of mind always. ALL ABOUT THE DRESS – brought together the Junior and Senior Schools in a celebration of both our matric and our Grade 1 girls. MOVIE NIGHT – The Greatest Showman watched by over 400 of our community, under the stars on the Garth was once again really special. TERM 2 – has our annual parent social, the Mexican Fiesta scheduled for June 21 and we are hopeful that this year’s evening will be as successful as last year’s. The PTA raised a net total of R548 700 in 2018 and have budgeted an income of R 800 000 for 2019. Together with the School Executive, we have earmarked the construction of the Wellness Centre in the Gym Building as our big project for this year. We anticipate that this will be undertaken and completed by the end of the August break. We would like to extend a sincere thank you to all our Class Reps and parents who tirelessly assist in making our fundraising efforts a success. FOOTLOOSE FRIDAY – The PTA together with the School’s Service Department, collected 1960 pairs of shoes during Footloose Friday for distribution to a range of beneficiaries. Thank you to all of our girls for bringing in your gently worn shoes. The Shop has relocated to Etunzi. We have commissioned shop fitters to undertake a fit out of this new space and this will be ready for us all to enjoy at the beginning of the second term. Look out for lots of new and fun offerings in the shop. We wish you all well over the holidays. Travel safe and rest well.